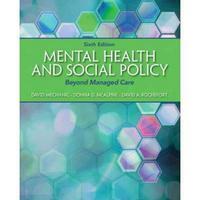 Mental Health and Social Policy 6 Edition The most authoritative evidence-based approach to mental health policy and design. Rooted in research findings that support an evidence-based orientation to treatment and recovery, the sixth edition of Mental Health and Social Policy takes a multidisciplinary approach to mental health and social policy. It examines the nature, origins, distribution, and consequences of disorders, while detailing information on the services, programs, and social policies that have been developed to assist people with mental health problems. Learning Goals Upon completing this book, readers will be able to: Understand the nature, origins, distribution and consequences of mental disorders. Examine the services, programs, and social policies developed to assist people with mental health problems.